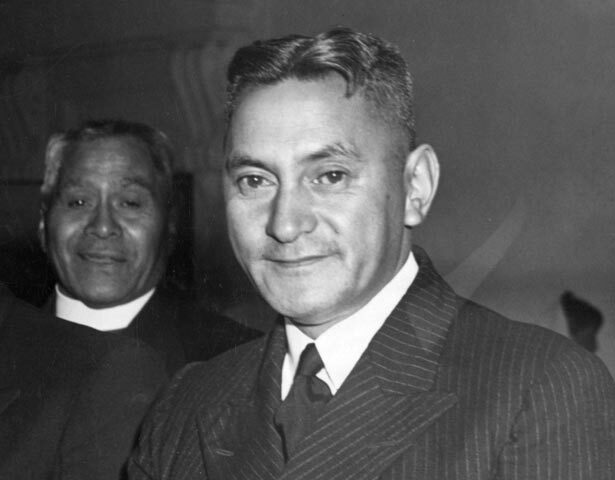 Korokī Te Rata Mahuta Tāwhiao Pōtatau Te Wherowhero (1908/9?–1966) was the eldest son of Te Rata, the fourth Maori King. When his father died in 1933 he did not want to become King. He felt he was not fit for the task, and because his people were so poor he doubted whether they could support a king. At Te Rata's tangihanga (funeral), however, all the visiting chiefs agreed that the kingship should continue, and that Korokī should be king. Throughout his reign he struggled to maintain the dignity of the Kīngitanga and obtain recognition. Many of the younger Maori leaders, including Āpirana Ngāta, thought his claim to kingship was pretentious. They rejected anything that did not support the sovereignty of Parliament. King Korokī's status was sometimes acknowledged by the government, and sometimes not. In 1939, the government refused to exempt him from registering under the social security regulations. The Waikato tribes saw this as disrespect, and refused to attend the Treaty centennial celebrations in 1940. Attempts to settle the Waikato confiscation claims formed another theme of Korokī's kingship. However, when it was achieved the settlement did not include a statutory recognition of King Korokī's position. From the late 1950s his health deteriorated, and he left public life. He died at Ngaruawahia in 1966. Ko Korokī Te Rata Mahuta Tāwhiao Pōtatau Te Wherowhero te tama pakeke rawa a Te Rata, te tuawhā o ngā Kīngi Māori. Nō te matenga o tōna matua i te tau 1933, kāore a Korokī i pīrangi kia eke hei Kīngi. Kāore ia i whakapono ka tareka e ia te waha i te Kīngitanga. I tua atu, i te tino kino te rawakore o tana iwi; e kore pea e taea e te iwi te noho hei taituarā mō te Kīngi. Heoi, i te tangihanga o Te Rata ka whakaae katoa ngā rangatira o ngā iwi kia haere tonu te Kīngitanga, ko Korokī hei Kīngi. Puta i ngā rā katoa ko ia te Kīngi, i ngana ia kia arongia te mana o te Kīngitanga. Kāore i tautokona tana tū hei kīngi e ētahi atu rangatira pērā i a Āpirana Ngata. Whakahēngia e rātou ngā kaupapa kāore i raro i te mana o te Pāremata. Hei ētahi wā ka aro te kāwanatanga ki te tūranga o Kīngi Korokī, hei ētahi wā kāore ia e arongia. I te tau 1939, kāore i whakaaetia e te kāwanatanga kia tū a Kīngi Korokī rāua ko tōna hoa wahine ki waho o ngā waeture penihana. Koirā te take kāore i haere ngā iwi o Tainui ki te hui whakanui i te rau tau o te Tiriti o Waitangi i te tau 1940. Ka whai a Korokī kia whakataungia ngā kerēme mō ngā whenua o Waikato i raupatutia. Heoti anō, i te tutukitanga o ngā kerēme, kāore i whakaturehia te mana o Kīngi Korokī. Atu i te paunga o te tekau tau atu i 1950 ka heke haere te hauora o te Kīngi, ka whakawātea ia i ngā kaupapa tūmatanui. Nō te tau 1966 ka mate ia i Ngāruawāhia. We have 2 events in history, 40 biographies, 5 articles, related to King Korokī.